Here you'll find a list of some of my projects. Click on the titles or images of each project to see more information. ​Published projects are published under the company name Mach One Software (Website | GitHub | Facebook | Twitter). ​This isn't so much a software project, because I built it with Weebly, a drag-and-drop editor. However, after picking a preset theme, the rest of the design is 100% me. In fact, I was able to build the website in one weekend! Just like the website you are on now, www.machonesoftware.com is mainly a portfolio website to show my published projects, to provide contact info, and to have kind of a hub for news and information. Not sure what to order? Get some ideas for pizza night.​ Just ask for a random pizza. This was my first published skill for Amazon Alexa. ​Stuck in a creative rut? Use this random color generator and enjoy choices such as "Fuzzy Wuzzy" Brown and "Real Men Wear Pink" Pink. Just another fun skill to practice creating Alexa skills. JCalc is my first fully functional Android app. It started as a "simple calculator" assignment for my software engineering course. I wanted to take it one step further and publish it on Google Play. Microsoft Small Basic was the first programming language I learned. It's very simple and geared toward beginners. Turtle House was my first Small Basic program. Small Basic includes a Turtle object, similar to that of the 1970s language Logo, which provides an interface for drawing lines on a graphics window. This program is a presentation I made for my ninth grade geometry class. 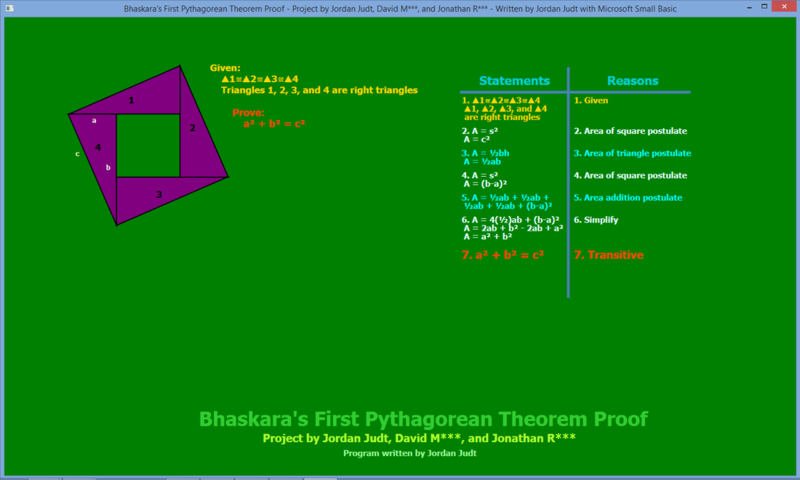 We were to choose a proof of the Pythagorean Theorem, and present and explain it in front of the class.